Nothing is a bigger slap in the face to a cyclist than cycling through a headwind. A sudden gust will quickly zap your energy, motivation and speed. But you don’t have to let a stiff breeze get the best of you. You just have to know how to fight back. Cycling in baggy clothing will quickly turn you into a giant parachute. Wind loves excess fabric, so dress in a form fitting jersey or jacket with lycra shorts or tight-fitting pants. If you remove the jacket, stash it tightly in the rear pocket of a jersey instead of tying it around your waist where the loose sleeves could dangle and get caught in your spokes. Also, pay attention to the aerodynamics of your bike opting for panniers or a single wheel touring bike trailer, over backpacks and messenger bags. Remove any excess zip ties, mounts or lights that you aren’t using. You may not have a fancy carbon bike with a low stem and drop bars, but you can still learn a few tricks to get into a lower position and hide out from the wind. Regardless of the bike you’re riding, when a headwind hits, you want to get as flat-backed as possible. 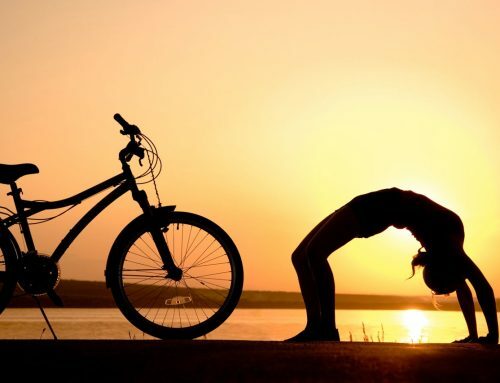 Grab the tops of your bars, bend your elbows, slide back on your saddle and ride in a flatter, more crouched position. If you have drop bars, use them. 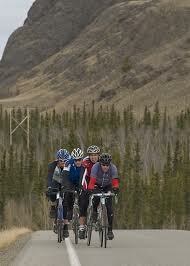 Keep your elbows loose and relaxed and watch for cross winds that could suddenly blow you into another direction. If you can, ride in an area sheltered by buildings or trees. Face it: your speed will always suffer when cycling through a headwind. You can either fight it and burn out your engine early or anticipate a lower speed and roll with it. This usually means shifting into a lower, easier gear. Don’t soft pedal. Keep some tension on the pedals and spin a nice smooth gear that you can maintain. If you don’t have a set bike route, try to begin your bike ride by cycling into the headwind and finish with a tailwind when you’re low on energy. Riding home with a tailwind is also a mental boost after you’re tired from fighting a headwind. Wind can be mentally defeating, so it’s important to realize this early on and see it as a challenging way to boost your fitness or burn a few extra calories.